Kerryn Slawson, 50, has been receiving food at Moraine Valley Community Church for nearly a year. Not long ago, Kerryn Slawson was making $100,000 per year at a job in transportation. About a year ago, Kerryn lost her job. And, she was recently given custody of her sister’s seven and 11-year-old daughters, after their mother passed away. Now, Kerryn, 50, struggles to feed her own three sons, and her sister’s children. 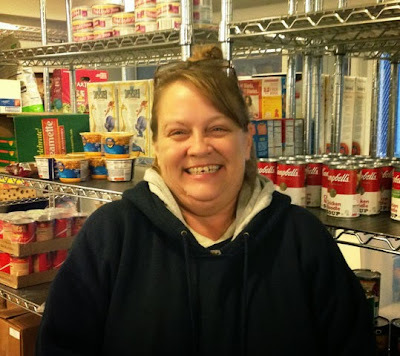 So, she gets food assistance twice a month from the Moraine Valley Community Church food pantry, a Greater Chicago Food Depository member agency in Palos Hills. She receives fresh produce, nonperishable items, and meat at the pantry. Kerryn is working assorted jobs while she looks for full-time employment. “I need a full-time job really badly. Anything helps, but it’s just that no one is hiring right now,” she said. On a recent Thursday, Kerryn was just one of nearly 30 people waiting in line outside the food pantry before it opened. In October, the pantry served nearly 600 people, a record for the 13-year-old agency. Help the Food Depository provide meals for the 1 in 6 who are hungry in Cook County. Donate now!